Our parent’s 50th anniversary is just two weeks away so Mom has been sorting through some old photos for us to scan for a slideshow. 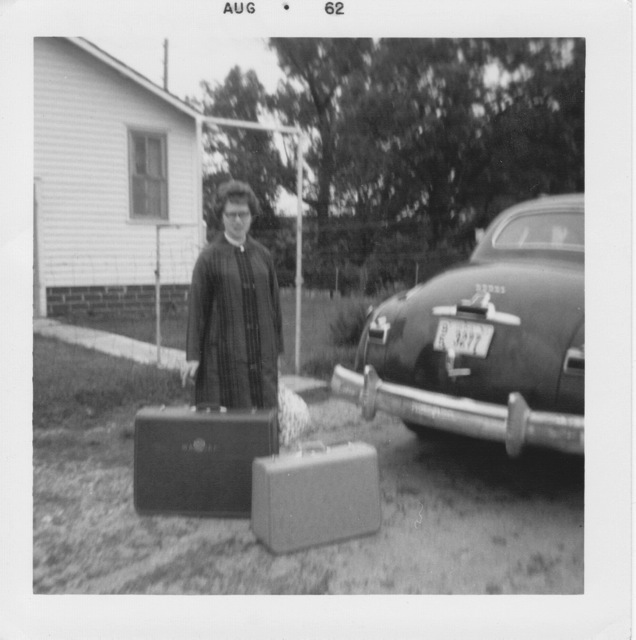 One of the fun finds in her stacks of pictures is a snapshot of her standing in front of the family Dodge with her suitcases. Written on the back of the photo is “leaving for Bible School” and the date on the front is Aug – 62 (Mom attended two years of Bible College at Lutheran Bible Institute which was located in Golden Valley, MN, In 62 she would have been 20 years old). 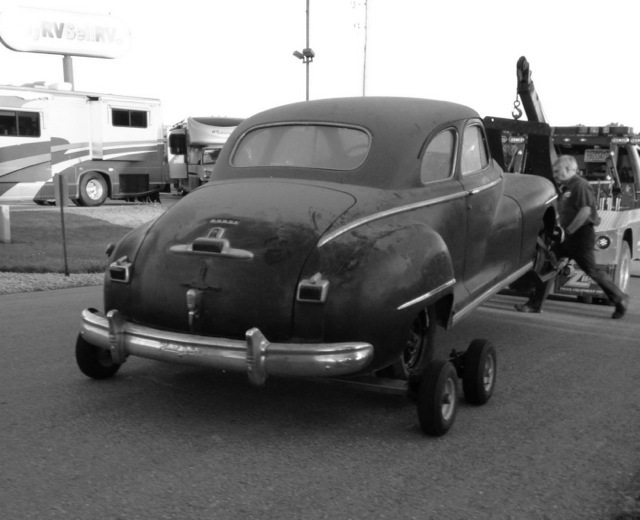 Now here’s the Family Dodge History Mystery – Is Mom standing in front of our 1947 Dodge? Or is she standing in front of the OTHER black, two-door, Dodge her family owned? Yes, our Grandparents had TWO nearly identical Dodge Club Coupes – a 1947 and a 1949. Both were black but, from what we understand, the ’49 Dodge used to be green and was painted over. Even if any green color showed the paint through in real life, we sure wouldn’t be able to tell if the Dodge in the picture was the once-green ’49 Dodge or the always black ’47 Dodge because the picture is, of course, black & white. For fun and so it will be easier to compare, I cropped one of the pics Joel took of the 1947 Dodge on the day John hauled it home for us and changed it to B&W as well. Can you tell if the Dodge our Mom is standing by is the same Dodge as our 1947 Dodge in the picture below? I can’t. For one thing, I’m unable to tell if the picture above has “Fluid Drive” stamped into the rear bumper. If it does (maybe I can somehow enhance the picture and get a better look) that in itself doesn’t mean this is the ’47 Dodge because for all I know the ’49 Dodge’s also had Fluid Drive. Time to do some research, I guess. Mom told me she has some more pictures of the ’47 Dodge that she copied for us. Maybe those pictures will help us solve this Family Dodge History Mystery. And maybe the year of the Dodge in the picture above will always be a mystery. Either way, we’ll enjoy seeing the pictures because I’m betting each picture will present a mystery or two of its own.